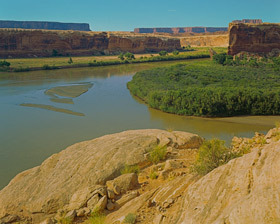 Green River At Hardscrabble Bottom, Canyonlands National Park, Utah, 1971 by Philip Hyde. 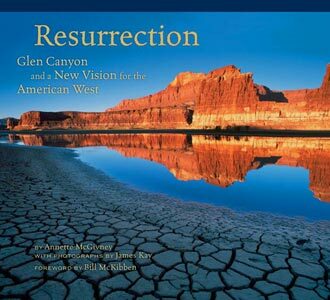 First published in "Slickrock: The Canyon Country of Southeast Utah," 1971, in the Sierra Club Exhibit Format Series. (RAW SCAN--not yet printing.) 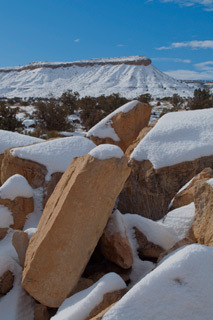 Edward Abbey's caption for this photograph in "Slickrock" was "Hardscrabble Bottom along the Green. A great good place. 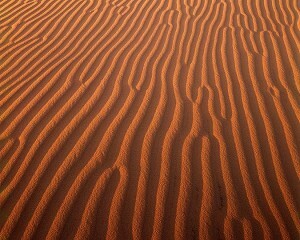 A man could whittle away his life down here and never lose a minute." Edward Abbey attracted a cult following but was uncomfortable with it. His books today enjoy an ever-widening readership, as the modern environmental movement that he helped popularize continues to grow. 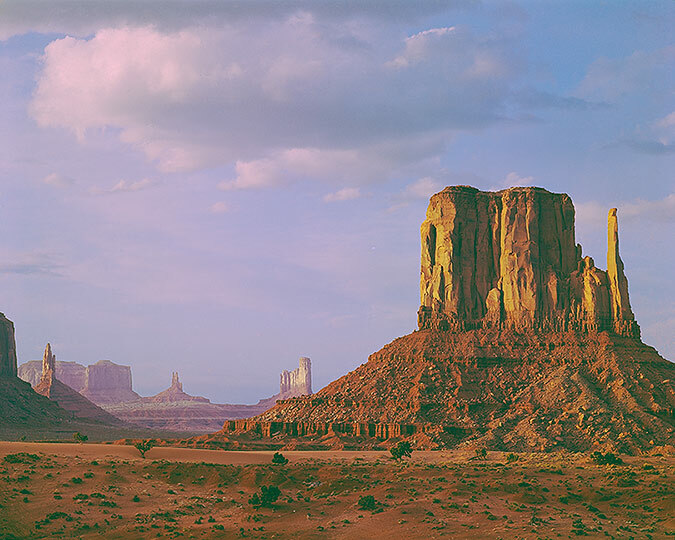 Desert Solitaire , Edward Abbey’s crowning achievement is a lament for wilderness lost, a celebration of a quiet life in the desert landscape and a portrayal of the Southwest unlike any other. Edward Abbey’s enjoyable romping anarchist novel The Monkey Wrench Gang is on a similar list for environmental activists who would prevent the plundering of natural resources. His wry wit and vivid prose carry on the legend of Edward Abbey. 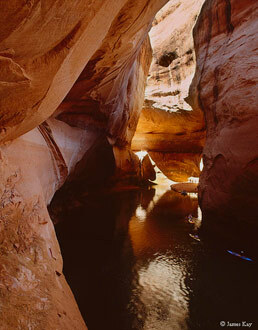 Edward Abbey and a friend had been exploring a small canyon near the Doll’s House (In the Maze, Canyonlands). Friend, scrambling solo, encounters man with tripod on the rimrock. Cameraman explains he is doing a book. Funny, friend says, so is my buddy. Cameraman asks identity of buddy. Edward Abbey, says Friend. Funny, says Cameraman, same book. Friend hollers down canyon: Hey, Ed. Guy up here says you’re collaborators. Abbey scrambles up. Ed Abbey, says Friend, meet Philip Hyde. I remember Abbey in a sandstone window overlooking a maze of canyons that wind off toward the deep gorge of the Colorado River. He was chewing on a blade of grass and his sombrero was low again in observance of sundown. Darkness was coming on fast. Time to return to camp. Abbey removed the hat and holding it level, slowly extended his arm toward the big river. Though it struck me as an unusual gesture, it was at once natural and moving. Abbey, saluting the Slickrock with that silly sombrero, reaching out to the stark chiseled bounties of that wild beyond. Do not jump into your automobile next June and rush out to the Canyon country hoping to see some of that which I have attempted to evoke in these pages. In the first place you can’t see anything from a car; you’ve got to get out of the goddamned contraption and walk, better yet crawl, on hands and knees, over the sandstone and through the…cactus. 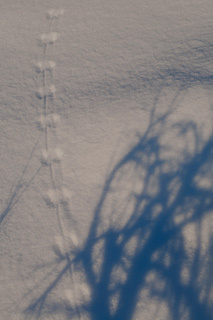 When traces of blood begin to mark your trail you’ll see something, maybe. Greg Russell of Alpenglow Images wrote a thoughtful post yesterday called “Aspen Trees and Staying Close to Home” in which he wrote about Edward Abbey and also decided to photograph near his home rather than traveling for Fall color. His results were just as fine, in my opinion. Solitaire and The Monkey Wrench Gang. up in and around the village of Home. Although he moved to the western U.S.
county, where he learned to love nature. Abbey died in Tucson, Arizona, in 1989. From an environmental activism perspective, possibly the most important historical fact about Edward Abbey is that he helped start the environmental organization called Black Mesa Defense Fund, the first radical environmental group, after which Dave Foreman later patterned Earth First. The Black Mesa Defense Fund direct-action campaign against the strip mining on Black Mesa, shared by the Navajo and Hopi people, was organized by the American Indian Movement, Edward Abbey, Marc Gaede (a photographer and environmentalist who also taught a few workshops with Philip Hyde), and others in 1970. Black Mesa Defense Fund is considered the first modern-day environmental confrontational protest organization. Epitaph For A Desert Anarchist: The Life And Legacy Of Edward Abbey by James Bishop, Jr.
By Steve Sieren on his blog called “Thoughts, Ideas and Experiences.” While Steve Sieren is not strictly a mountain photographer, he does it with skill and a has a knack for getting way out in the backcountry in all types of terrain. 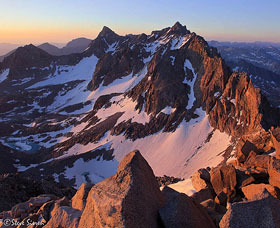 Palisades Glacier, Sierra Nevada, 2010 by Steve Sieren. From the top of Mt. 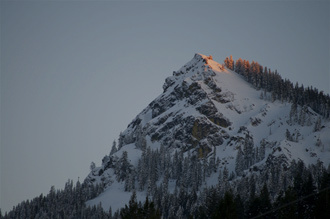 Agassiz, the 20th highest peak in California. I first heard from Steve by e-mail. He wrote to say that he had been a fan of outdoor photographer Carr Clifton and had heard of my father, pioneer landscape photographer Philip Hyde through Carr Clifton. He told me he would unfortunately miss the Santa Monica Exhibition but just after it came down when I was in Los Angeles, he offered to show me some little known photo spots around the area. He came across as a genuine, approachable, friendly and kind person. Since then we have kept in touch and he has been helpful regarding many subjects. 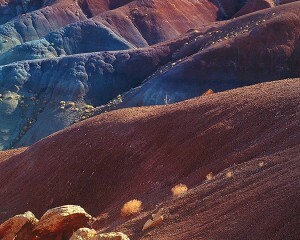 I still plan to go on one of his field workshops where he takes people out and shows them areas they perhaps have never seen in California, Arizona, Utah, and Nevada. “Most of the workshops are in the California deserts, mountains and coastal areas,” Steve Sieren said. 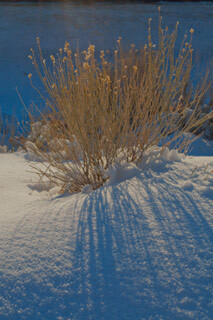 One of the reasons I admire Galen Rowell is that he was a self-taught photographer. Steve Sieren is also essentially self-taught, though he took some workshops including one from Marc Muench. He said he did have help from “many friends and mentors along the way…in other fields of photography.” Los Angeles offers some of the world’s best photographers in a number of genres and is one of the up and coming world art scenes. I admire Steve Sieren because even though he lives in a major metropolitan area, he values wilderness and getting out in it. Also, he is a great story teller. Visit his latest blog post for some real action and excellent images. It shares his adventures on a spontaneous hike and unplanned overnight stay at the top of California’s 20th tallest peak. 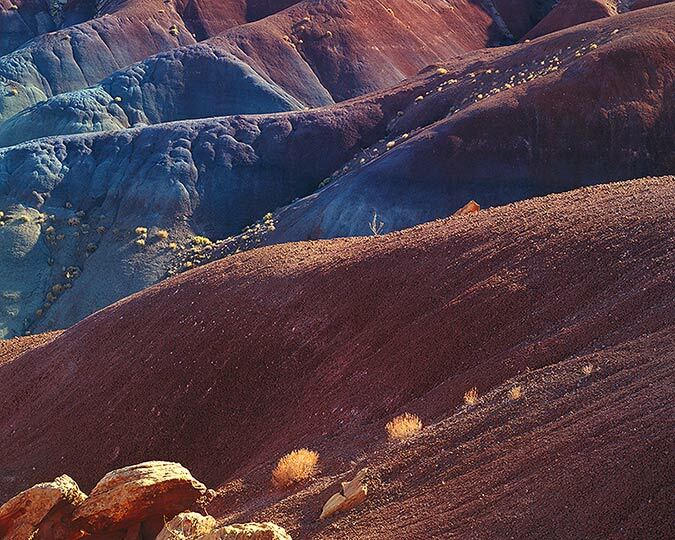 Hats off to Steve Sieren who is doing today what some of the early pioneer landscape photographers did back in the day, but with a more adventurous and spontaneous twist. 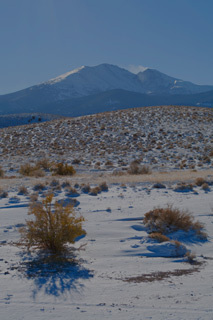 Be sure to also scroll down or poke around and find his blog post about snow camping too. Did you have a favorite vehicle growing up? What kind of rig do you use for photography or other work you do? 1952 Chevrolet Pickup, Perhaps much as Covered Wagon looked new, perhaps slightly greener and a little less shiny. In the early 1950s, pioneer landscape photographer Brett Weston drove back and forth from New York to California via Texas, up and down the East Coast, to Mexico and widely explored the Western United States. 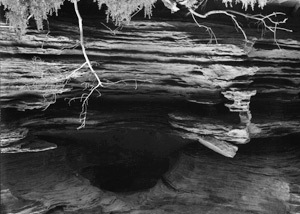 For more on Brett Weston, his photography and his influence on all of landscape photography see the blog post, “The Hidden Brett Weston.” In 1955, Brett Weston settled down for a time in Carmel to help print his father, Edward Weston’s photographs. Brett Weston in the Spring of that year, sold his traveling rig to Ardis and Philip Hyde. 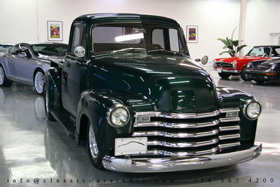 The dark-green 1952 Chevrolet step-side pickup complete with a metal canopy made the ideal photographer’s camper. Knowing my parents, if Brett Weston had already called it “Covered Wagon,” they might have named it something else. It seems like an Ardis and Philip Hyde name, but you never know. I seem to remember my mother saying, “We’ve always called it our Covered Wagon.” Whether Brett Weston gave it the name or gave it another name, and which of his many journeys he took the truck on, is yet to be discovered. Regardless, after the pickup came from Carmel to the Northern Sierra Nevada, it did not stay home for long. Fate ordained it would be a traveling truck for many years, even after I was born in 1965. I knew Covered Wagon well. By the time I grew to the age I would remember anything though, the old dark-green truck was going on 20 years old and had long since shed its silver corrugated metal rounded shell that made it look like a covered wagon. By the 1970s our old friend had been relegated to local trips to buy groceries and hauling horse manure, hay and rocks for the garden. Besides gardening, landscaping and building supplies, Covered Wagon had become primarily a wooding truck with tall wooden framed-in sides for the back end. I loved that old truck. It had running boards and the spare tire on the side behind the flared front wheel well. As a boy who felt inadequate in many ways, especially in junior high school, I wanted my parents to give Covered Wagon to me so that I could “jack it up” and attain the status of cool. My parents did hold on to Covered Wagon much longer than most vehicles they bought new, owned for exactly 10 years and sold. When Mom and Dad finally did sell it to a local guy who liked old trucks, while I was away at prep school in the early 1980s, I made a big protest, even though I had outgrown my hot-rodding fantasies by then. It was the end of an era. 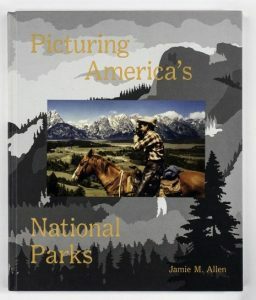 In June 1955, my wife and I set out in our newly acquired camping pickup to find out how a summer of being on the move would help us to accomplish our prime purpose of studying and interpreting photographically the western natural scene. Our plans were flexibly hitched to a series of Sierra Club outings. What follows is a collection of extracts from our trip journals of some of the high points of our summer. 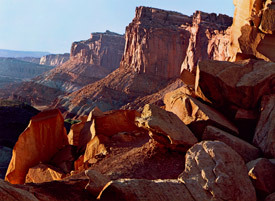 Capitol Reef from Cohab Canyon, Capital Reef National Park, Utah, 1978, by Philip Hyde. 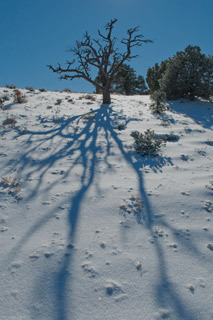 Nationally exhibited and first published in “Drylands: The Deserts of North America” by Philip Hyde. Some say this is a stronger, more majestic image than an earlier photograph made from the same location published in “Slickrock: The Canyon Country of Southeast Utah” by Edward Abbey and Philip Hyde. June 7. From our sandy bedsite by the Colorado River at Hite, Utah, we are recalling the activities of the past two days. Yesterday morning we got aboard a school bus at Marble Canyon Lodge, Arizona, for the climb over the edge of the Kaibab Plateau, and north, to Richfield, Utah, where we turned off the highway into some of the most colorful scenery of the Southwest. Last night we watched the moon flood its rising light over the great white and red cliffs of Capitol Reef National Monument. This morning, after a brief sampling of the Monument, we got back on the bus to rattle on through the heart of the uranium country. In every direction the landscape is punctuated by claim-marking cairns. 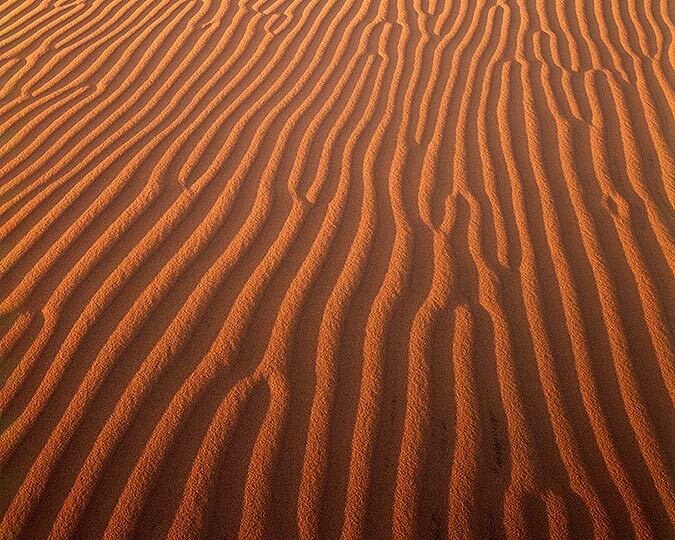 Will any stones be left unturned before the tide of the uranium madness recedes in this once remote and austerely beautiful desert wilderness? June 13. We started our walk up Aztec Canyon to Rainbow Bridge under heavy overcast. 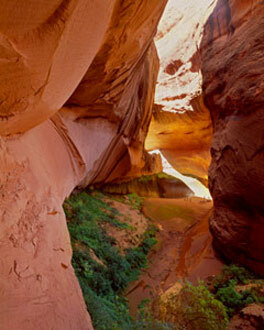 There is a wonderful passage where Bridge Canyon cuts through the walls of Aztec Canyon. 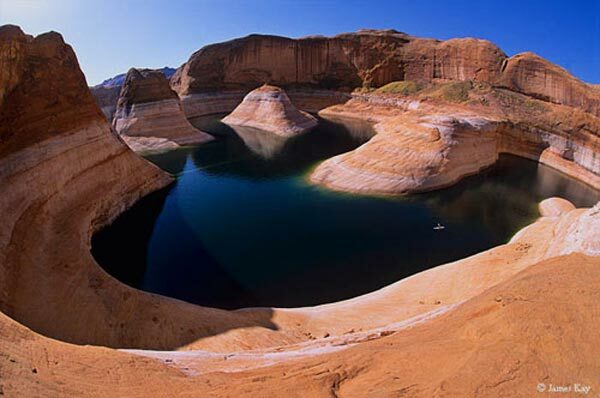 One of the choicest bits of canyon we have seen, this proves to be the precise spot where the Bureau of Reclamation proposes to build a cut-off dam to protect Rainbow Bridge from the waters that will be impounded by Glen Canyon Dam. Entering Bridge Canyon we walked on to the grand climax of the Glen Canyon trip. Rainbow Bridge’s mighty, free-standing arch was as impressive in the overcast lighting as it might have been in sunlight.